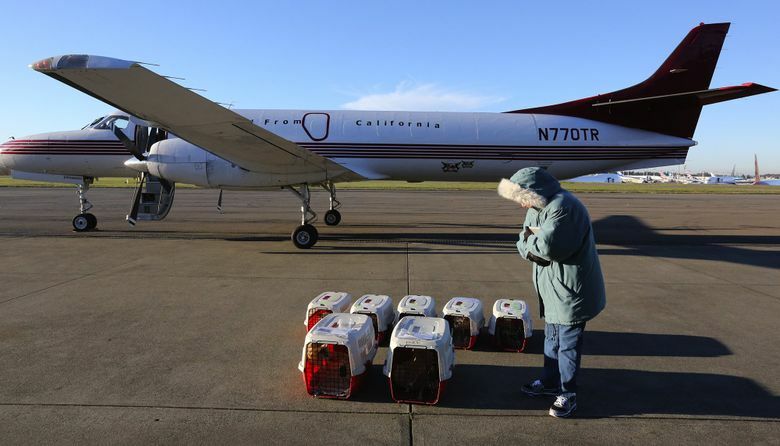 Some 1,000 dogs and 100 cats that had been destined to be killed at California shelters were flown Friday to various Pacific Northwest airports to be taken to no-kill shelters. 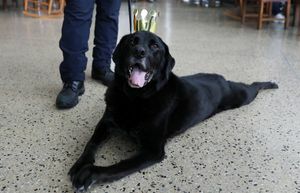 In these turbulent, sad days, we need a happy dog story. 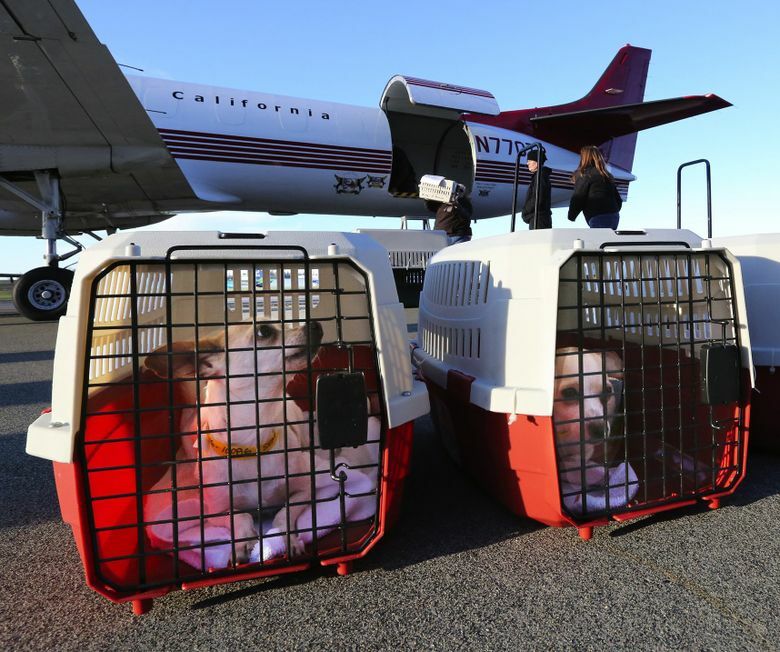 This is about 1,000 dogs and 100 cats that, instead of being euthanized, on Friday headed out in private planes toward happy adopted lives. A family to throw Frisbees for them. Kids who need to cuddle with them at night. A wagging tail that brightens the end of a bad workday. Want to adopt an animal? 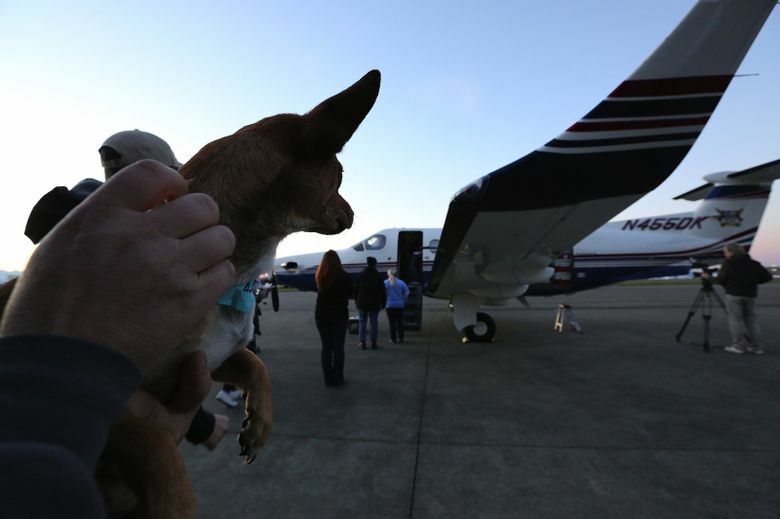 Go to the Wings of Rescue website and click “Holiday Airlift 2015” for a list of participating shelters. 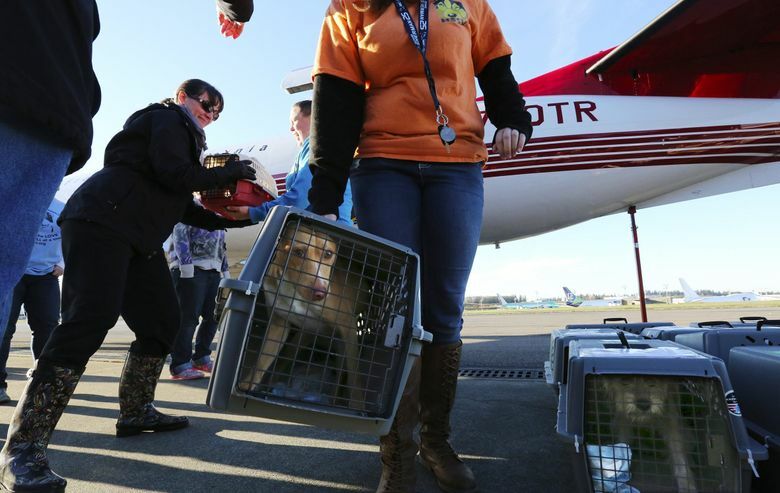 A batch of about 100 dogs and a few cats arrived at Paine Field in Everett from Van Nuys Airport on a Fairchild Metroliner twin-engine cargo plane. You could hear the barking even before the door was opened. Hey, what would you do if you had been in a stack of dog kennels for nearly four hours? The outnumbered cats were considerably quieter. Waiting for them were workers and volunteers for shelters that included the Skagit and Kitsap County Humane Societies, PAWS and the Noah Center. By now, the crews had a routine. Line up the kennels on the tarmac right outside Castle & Cooke Aviation. Check the paperwork. Start loading into the lined-up vans for the drive to the shelters. 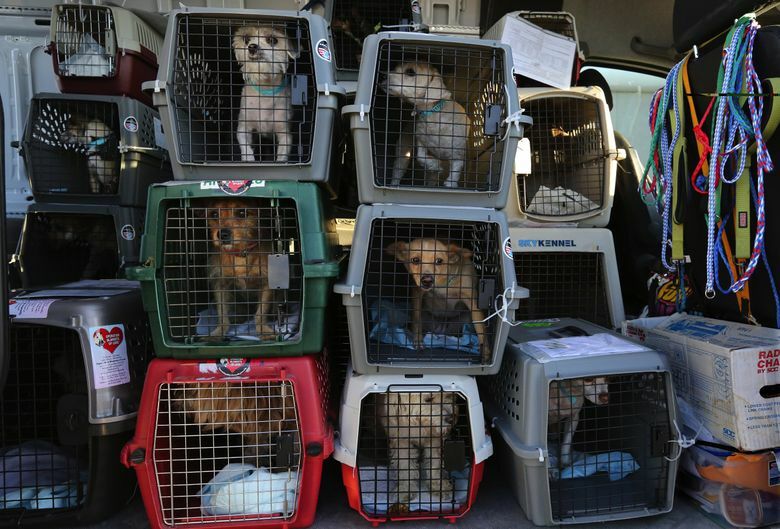 In California, shelters are overcrowded and euthanasia is common. 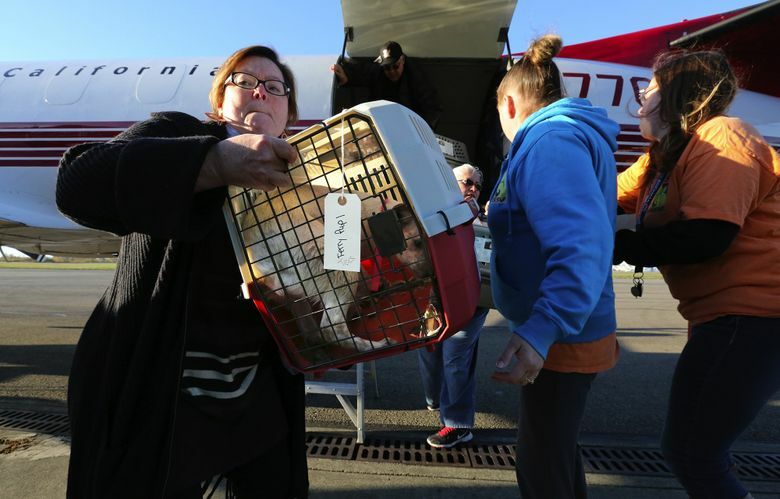 In the Pacific Northwest, shelters actively look for dogs. Says Ric Browde, the transport coordinator for the California group, “Washington is a godsend for us. You people, you’re more educated, more responsible. You have a higher level of humanity and compassion. People tend to vaccinate, keep pets indoors. 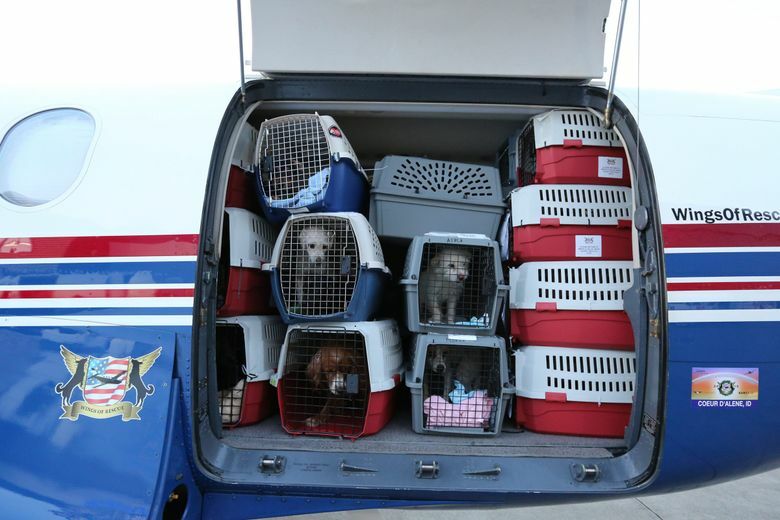 Wings of Rescue was founded by Cindy Smith, a real-estate broker, and Yehuda Netanel, a real-estate developer. Both also are recreational pilots and dog enthusiasts. Maybe a little more than enthusiasts. They decided to make dogs their cause. 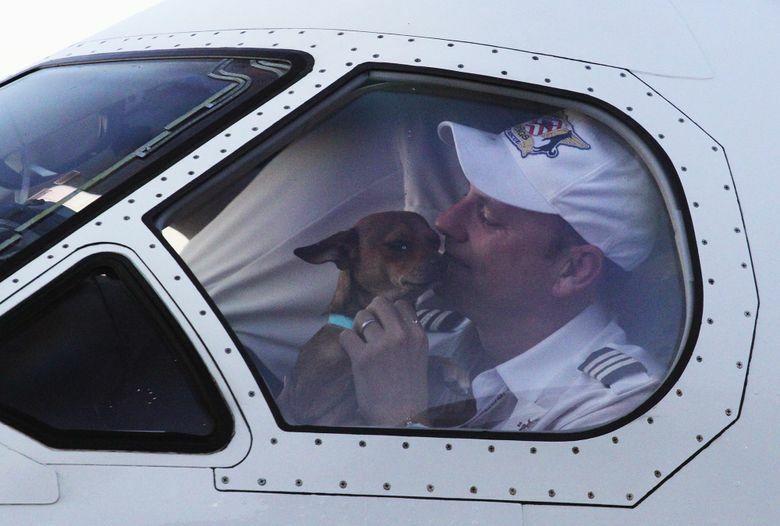 The two founded the group in 2011, with the idea of having pilots use their planes to save animals from kill shelters. 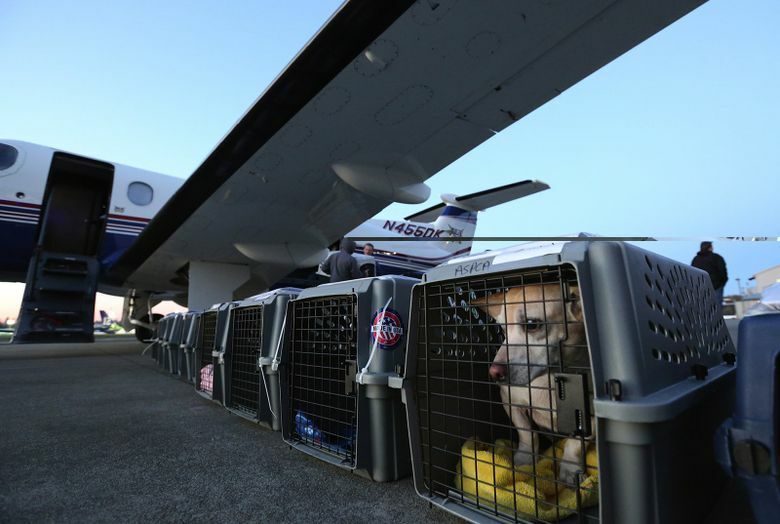 Their “squadron” of pilots has so far flown out 15,200 dogs, with some flights costing $2,500 to $5,000 for fuel and hangar costs, depending on distance. A few of the dogs came Friday with a little bit of narrative. “My name is: Tiger. I’ll be available: NOW! I’m an altered male, brown, short haired Chihuahua mix. My friends at the shelter think I’m about 9 years old. I came to the shelter as an owner surrender … ” says one. 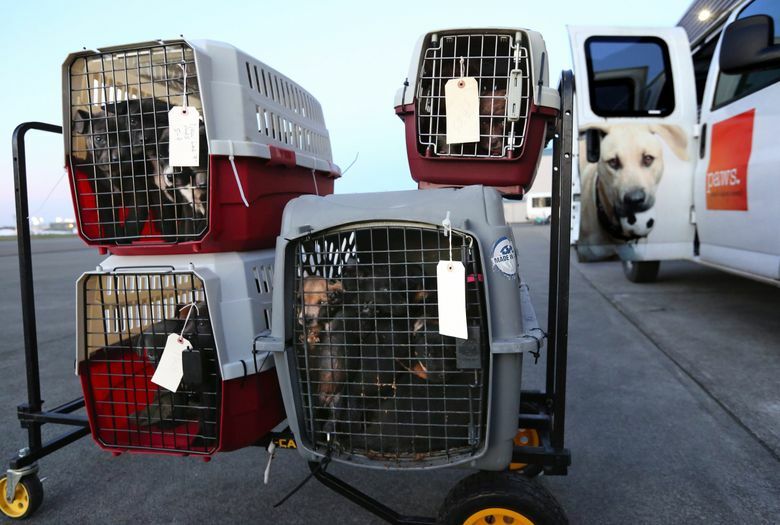 Browde says the California shelters that give them dogs typically don’t provide any kind of story about the animals. 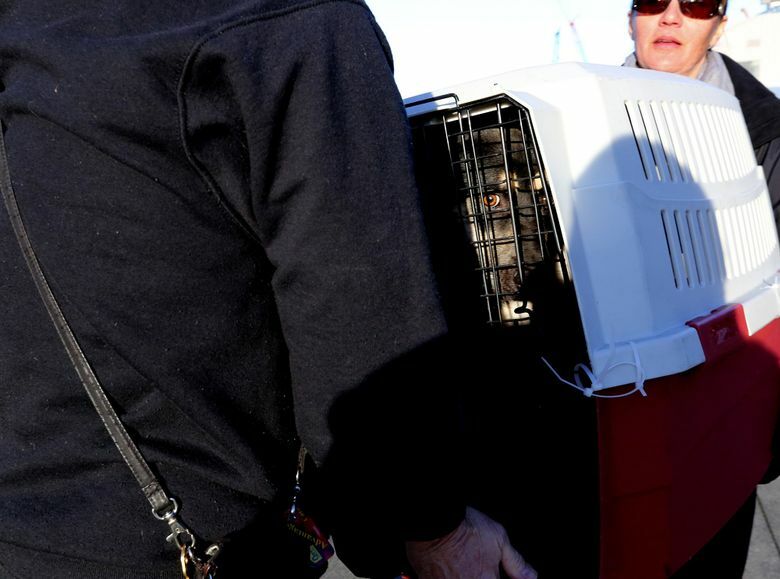 And forget about a short video that many shelters here use to attract possible owners. 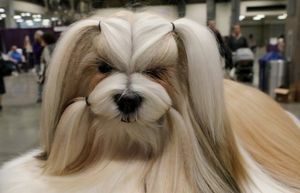 On his website, Browde took it upon himself to promote some dogs. 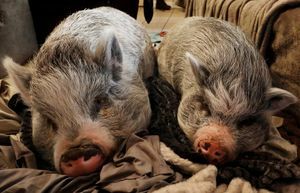 He says it works wonders to provide some personality to the animals, and they get adopted much more quickly. Browde also has the task of naming the dogs. It’s easier to adopt out a Monty than a No. A4881243 M.
After a few days of R&R, the new arrivals here will be ready for adoption. 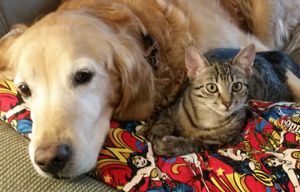 “Little furries for the holidays,” says Katherine Spink of PAWS. Or in the case of Roofer, a Rottweiler mix soon available at the Skagit Humane Society, a big guy who’ll lick your hand if you brush it past his kennel. Come on, and you know who you are, you need a Roofer in your life.